Can I use late model fuel pump filter with fuel return line in an early K100RS built 01/1985? I can't find a separate part number for early fuel pump filter without the fuel return line. From 05/1985 onwards part number is 16121455126. Maybe I could order the filter without return line from US/UK, but is there a way I get the early filter from BMW or will the model with return line fit in the early tank? The pump PRE-filter (#1 below) is used on all K-series bikes with the 52mm fuel pump. This didn't change throughout the production of the K100 and K75 all models. Are you referring to #10 below? You can buy the PRE-filter from Motorworks and Motorbins in the UK and EME in the US. They aren't very expensive. You'll pay more thru a BMW outlet. If you have a generic pump you might need a different PRE-filter to suit. There's no return line inside the tank. That hose with the inline filter (#10) is the output line. Throw up a photo so we can see what you got. 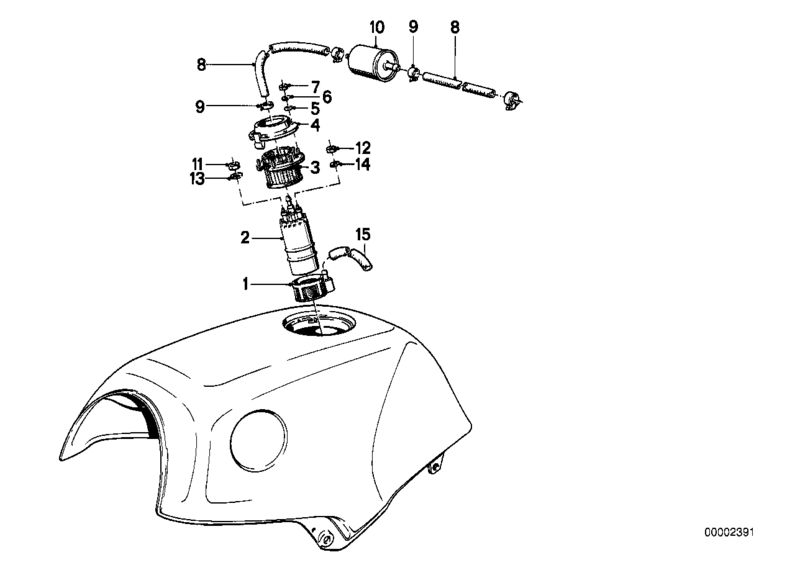 @Holister wrote: The pump PRE-filter (#1 below) is used on all K-series bikes with the 52mm fuel pump. This didn't change throughout the production of the K100 and K75 all models. The whole topic is about part number #1. The PRE fuel filter which sits in the fuel pump vibration damper. I do not get a part number for the PRE filter if I use my bike VIN in realoem.com. If I choose manually 05/1985, then I get the part number for PRE filter #01. According to euromotoelectrics the PRE-filter has changed during K100 production. If I order with part number 6121455126, then I get the late version from BMW. Question is still the same. Can I use the late version in my early version bike? I've not seen what you call the early version pre-filter. But I've never owned an early model K.
I wouldn't believe anything EME says. For people in the US, you can get a NAPA 3032 fuel filter for about $5. In addition.... EME use the same oem # for both 'pre' and 'post' versions. These are not BMW parts but are a Duralast brand. If BMW changed the design they would've given it a diferent part number. But if you choose a 05/1985 built bike, then it says from 05/1985. Well get the early version and use that if its what you've used previously. I don't really think it matters which one you use as long as it fits the end of the pump. @Holister wrote: Well get the early version and use that if its what you've used previously. I don't really think it matters which one you use as long as it fits the end of the pump. New version will fit the pump for sure, but will it fit the tank? Of course I can always buy the pre-version filter, but I can't get it quick from anywhere. Also ordering the filter from outside Finland will add the postage and in the end the filter will be pretty expensive. Also result of keeping old gas in the tank without using the bike for 15-20 years. ..... but will it fit the tank? .... because of the extension for the hose fitting??? As far as I know the metalwork inside the tank is the same for pre and post '85 tanks.... but someone please correct me if I'm wrong on that. Pretty sure it was just the external tank mountings that changed. Good job you got that rubber damper out just in time before it made a complete mess of the inside of your tank. The very early models have also a different rubber damper. I already bought the new model damper and supporting ring. Maybe I'll buy the new model filter. I'll try to grind of the return fitting if it does not fit. The pipe fitted to the later fuel pump pre-filters is a measure to prevent cavitation. I bought later model pre-filter because I bought later model damper earlier. Early and later model pre-filters and dampers cannot be mixed together. Later model pre-filter does not fit into early model tank without small tweak. Early model tank has small reinforcement in the cut where the damper sits. Later model pre-filter does not go in the hole because of the fuel return line fitting. I removed the small aluminium piece and filter fits. I plugged the return line fitting with a 5mm bolt and package was ready for installation. After 15-20 years, the old K100RS is up and running again. Runs pretty smooth after changing all vacuum lines and some other rubber parts to prevent air leaks.